LUXEMBOURG — The European Union largely abandoned hope of clinching a Brexit deal this month and a top EU official implored British Prime Minister Theresa May on Tuesday to come up with "a new method of thinking" on the Irish border issue that has stumped negotiators for over a year. With the leaders of EU countries meeting Wednesday, EU Council President Donald Tusk told May to think like a free spirit and "present something creative enough to solve this impasse" at the summit that previously was touted as a pivotal event in Britain's two-year departure from the bloc. 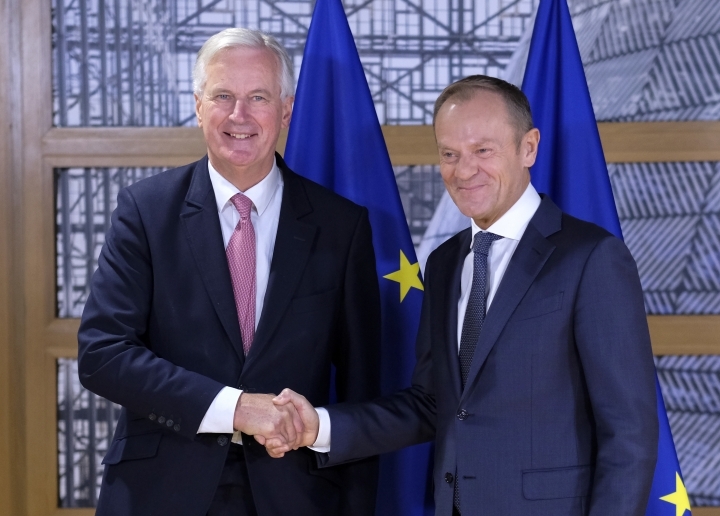 As prospects for a compromise stood ahead of the meeting, Tusk said there were "no grounds for optimism" about Britain and the EU reaching a deal. 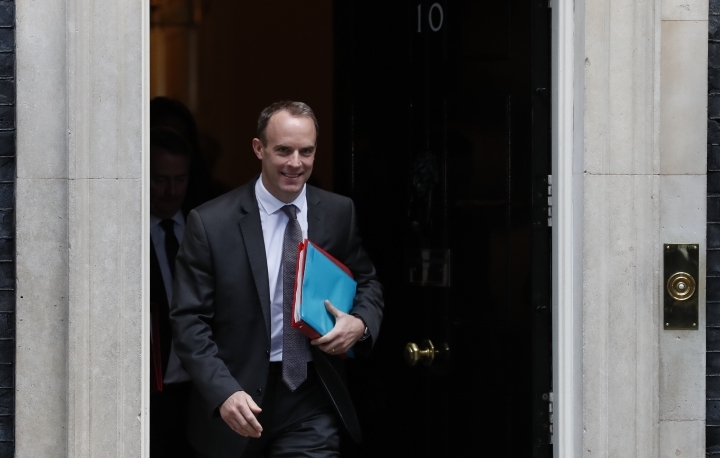 Members of May's own party and the Conservatives' parliamentary allies oppose the prime minister's current proposals for the future EU-U.K. border in Ireland, putting her in a political straitjacket that restricts the "creative" ideas Tusk seeks. "We sometimes feel the British are negotiating with the British," Belgian Foreign Minister Didier Reynders said, illustrating the EU's frustration. A breakthrough on how to keep the border between Ireland and Northern Ireland as porous as possible appeared close enough Sunday that EU officials thought Wednesday's summit would be a celebration of the elusive Brexit deal. But continued disagreement on the border issue sent both sides in the negotiations in search of revised positions. The EU said the process was expected to take a few more weeks, pushing the timeline for a deal into November at the earliest. 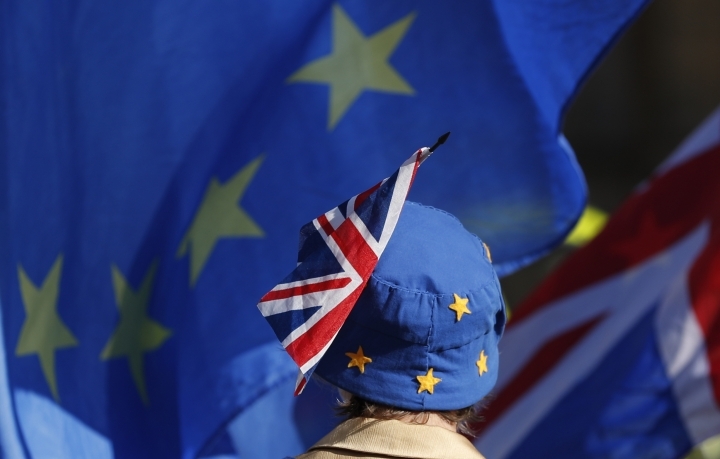 Negotiators are working toward coming to an agreement "in the coming weeks" to ensure Britain leaves the EU as scheduled on March 29 in an orderly fashion, the EU's chief Brexit negotiator, Michel Barnier, said. "We are not there yet," he said. "We will use that time — calmly, with serious intent — to find the overall deal." But aspects of the withdrawing member's future relationship with the EU are unresolved, Barnier said, most notably the border that will separate EU member Ireland and Northern Ireland, which is part of the United Kingdom. 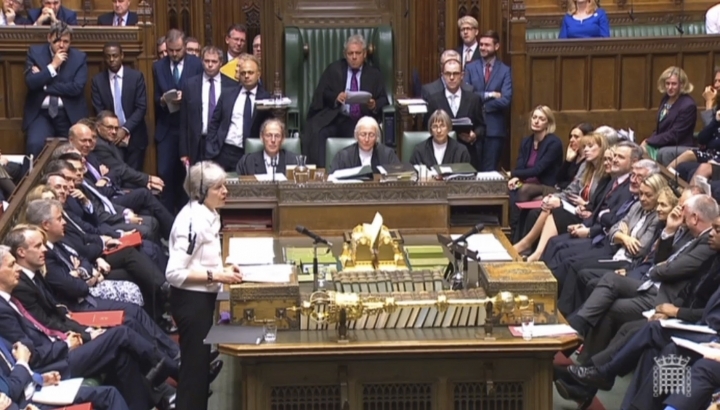 May has rejected the bloc's proposal for avoiding a hard border, which would keep Northern Ireland inside a customs union with the EU even if the rest of the U.K. leaves. She says that is unacceptable because it would impose new controls between Northern Ireland and the rest of the U.K. Instead, she has proposed keeping all of the U.K. in a customs union with the bloc — but only temporarily, until new trade arrangements are in place that alleviate the need for border controls. Britain insists such a solution cannot be permanent, while the EU says just as strongly that it must not have an end date. To illustrate the perceived intractability of the Irish border problem, Tusk on Tuesday compared it to the mythical Gordian knot that cannot be untied because it is so complicated. The ancient Greek warrior king Alexander the Great used his sword to slash through the knot when all else failed, according to the legend. 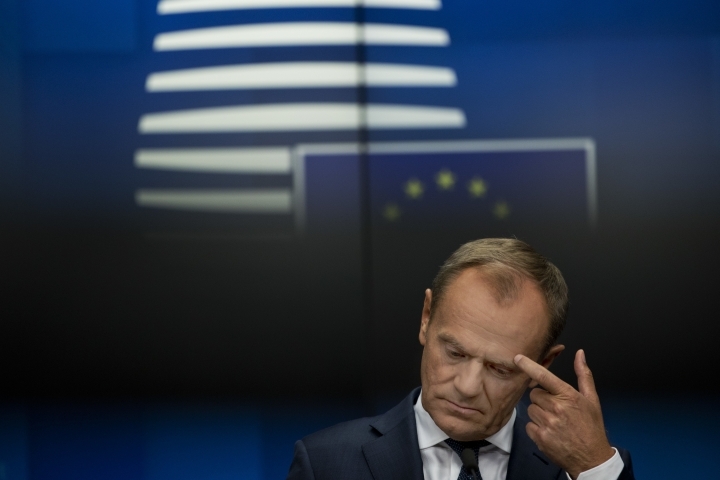 "Unfortunately, I can't see a new version of Alexander the Great," Tusk said. Asked whether he was referring to former British foreign secretary and Brexit champion Boris Johnson — whose given first name is Alexander — Tusk said: "To compare Boris Johnson to Alexander the Great is an exaggeration, I think." 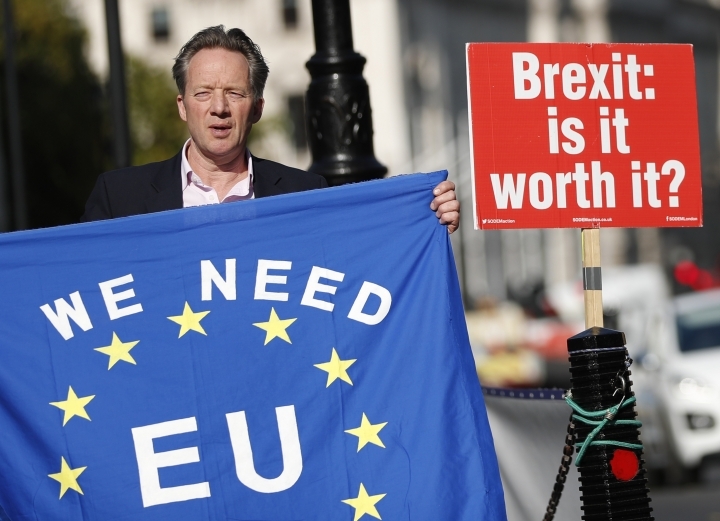 The EU said it was pressing forward with contingency plans to protect the 27 remaining member states if Britain crashes out of the bloc with neither a deal in place nor a transition period established. 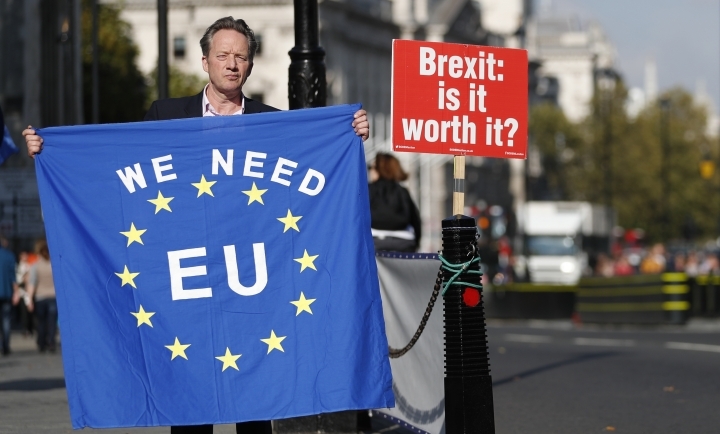 Tusk warned that chances of Britain leaving without a deal were higher than ever before. In London, May urged her divided Cabinet to back her amid growing talk that several members were ready to resign in protest of her government's proposals to the EU. During a three-hour Cabinet meeting Tuesday, May said the government must "stand together and stand firm." 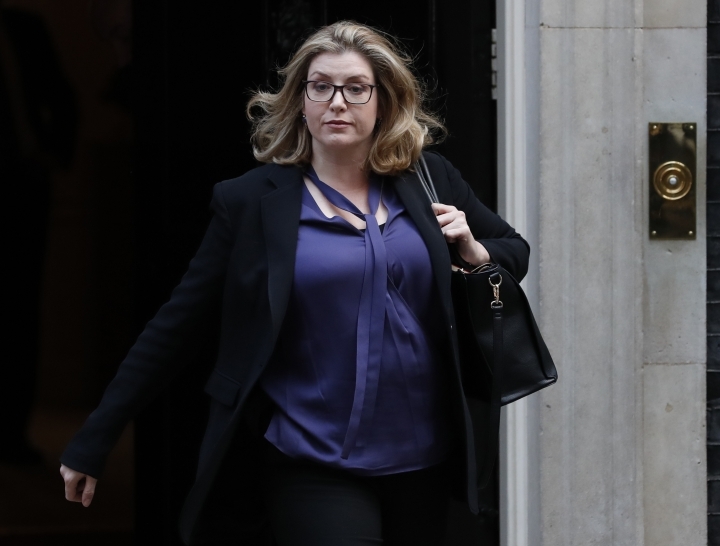 International Development Secretary Penny Mordaunt said after several ministers met privately over pizza on Monday night that "no one is planning on resigning. We are all doing our jobs and we are trying to get the best deal for this country, and that's it." Germany exhorted May to come to Wednesday's summit with a positive message that could kick-start the stalled talks. "Take responsibility and be constructive," said Germany's Europe Minister Michael Roth when he arrived for talks with Barnier in Luxembourg.